Happy New Year and welcome to a new term in Year 3. 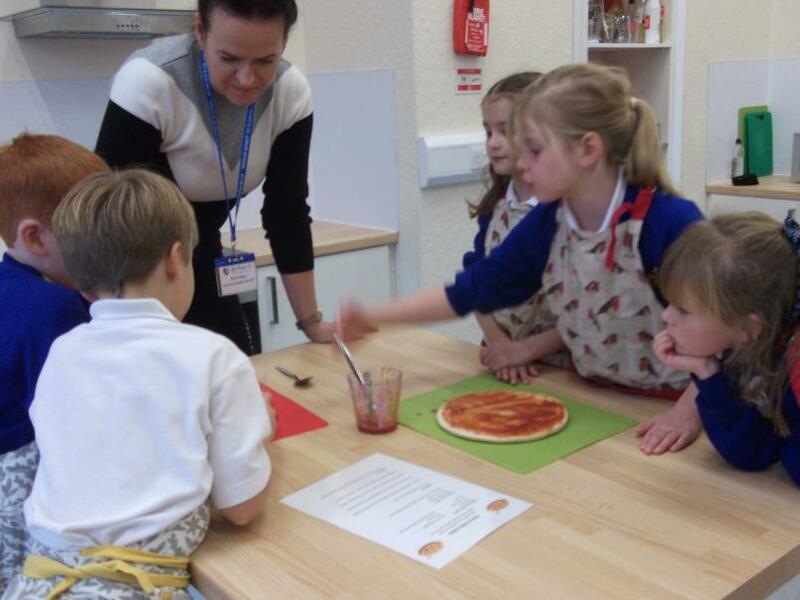 We have lots of exciting things to look forward to, including Science Week and an exciting visit to Butser Farm! This board in our Year 3 corridor keeps us up to date with what we are learning each week. Homework is set every fortnight. There will be a MyMaths activity to be completed online, and spellings to learn. Please also remember to read to an adult at home - if you read 3 times in a week, you will receive a merit! If you get bored, don't forget to practise your times tables! In order to broaden the children's vocabulary, we have started using a word of the day. If children use these in their writing, or when speaking to their teacher, they will be awarded a merit and a team point. RELINQUISH, SIMULTANEOUSLY, DEVOURED, WARRIOR, DWINDLE, IMPEDE, SMUGGLE, REVENGE. We will repeat these over the next fortnight in order to consolidate the children's learning of this new vocabulary. Please encourage your children to use these words at home. Thank you! IMAGINATION, JUBILANT, HYPNOTISM, FLAIL, PROFOUND, MARATHON, GERMINATE, CRIPPLED, SERIOUS, DELIBERATE. What can we tell about an animal from its skeleton? Using resources to help us with our maths. 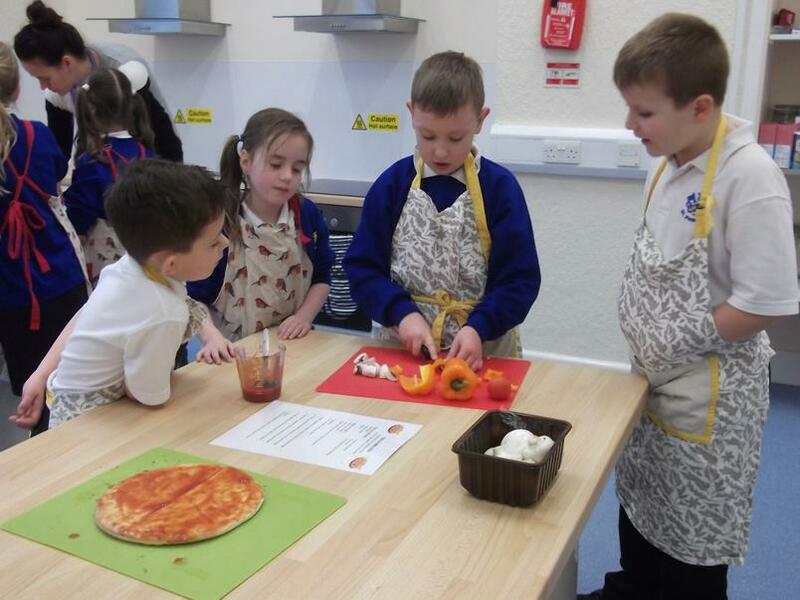 Making healthy pizzas in the children's kitchen. 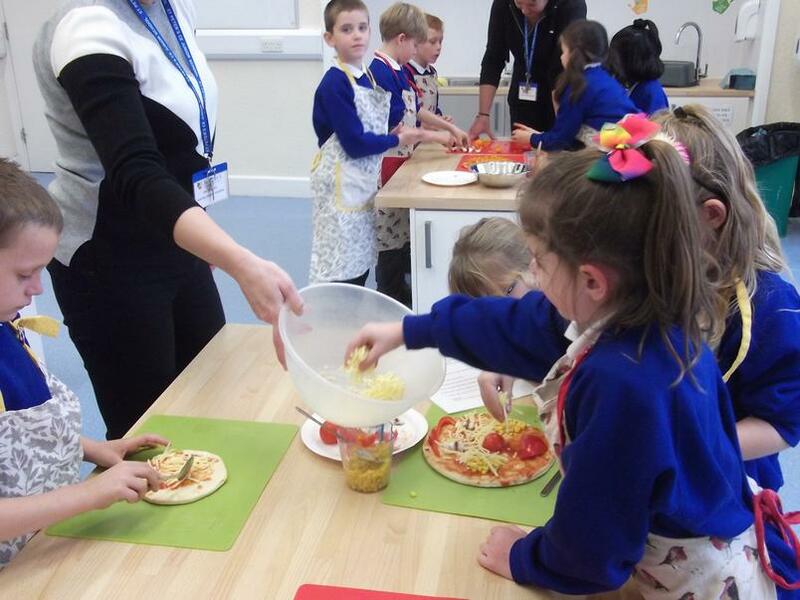 Year 2 children from North Farnborough Infant School visited us today and took part in a variety of activities. We played some games in the hall, and cheered on year 5 running the Golden Mile! We made paper chains to decorate the Year 3 corridor. Each child wrote their favourite memory from infant school, which was made into a chain which you can see above. We also wrote what we like most or are looking forward to most about junior school. These have been taken away by North Farnborough to be displayed there. Our art activity involved us making jigsaws of pictures of the two school buildings. In Science this term, we are looking at Electrical Circuits and how they work. This is the children's first attempt at having a go to see if they can make it work on their own. Some group were successful in making their bulb light up! During science week, Year 3 learnt all about flight as this was our topic focus from last term. In order to aid our understanding we had the pleasure of looking and making various things relating to flight. We even had the pleasure of holding some chicks and watching how birds of prey catch their food in the school hall. 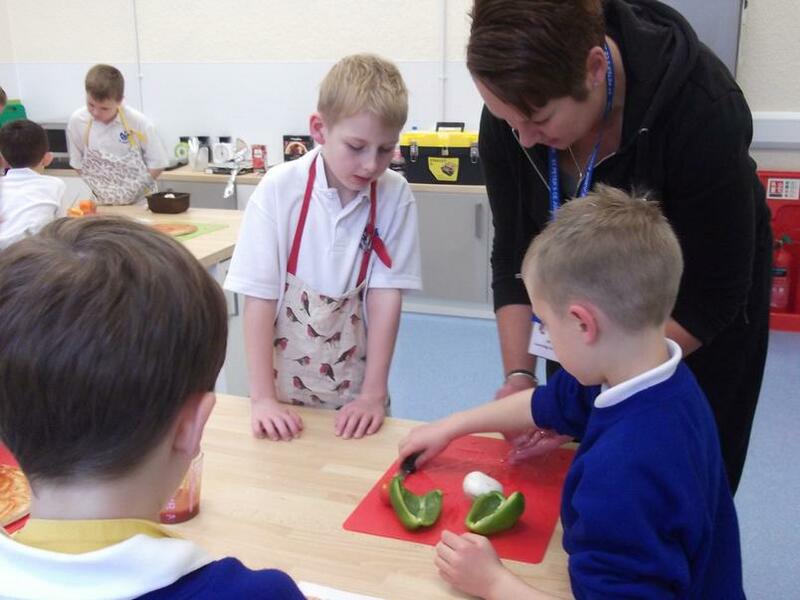 Our visit to Butser Farm kept not only the children busy but the adults too. We took part in 4 different activities which were wattling, archaeology, chalk carving and jewellery. 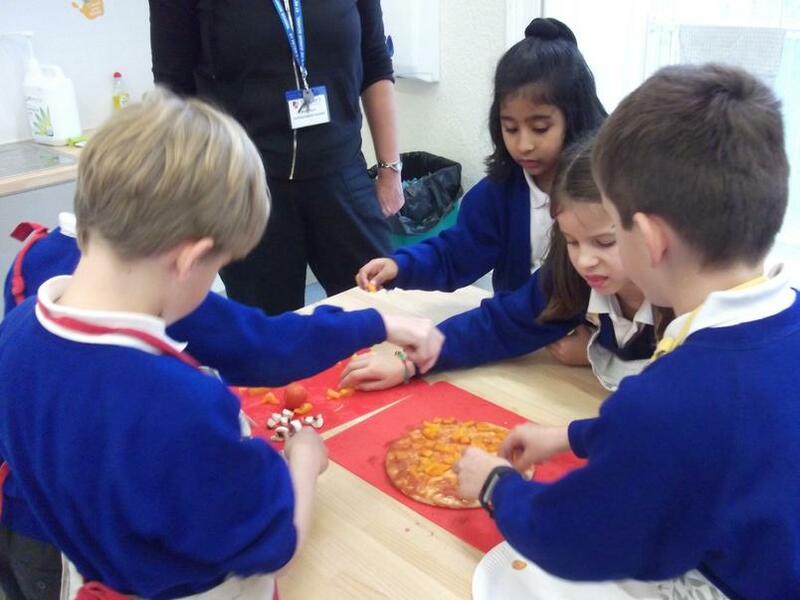 The children impressed the teachers with how much they had remembered about the Stone Age. We were lucky enough to sit in the sunshine and eat our lunch as well as having a run around and burning off some energy. As a memorabilia the children took home their jewellery and chalk carvings which I'm sure they were keen and excited to show you all. After visiting Butser Ancient farm we had the opportunity to make our own Stone Age houses out of clay. Some of use chose to make round shaped ones and others chose to make rectangular shaped ones. We hope you had an enjoyable Easter break and the children are looking forward to another exciting term, including our hook day.